With his arms crossed and a face bursting with pride, Argentina superstar Lionel Messi towers above all those on the main street of Bronnitsy, a town of 20,000 residents some 50 kilometres from Moscow. 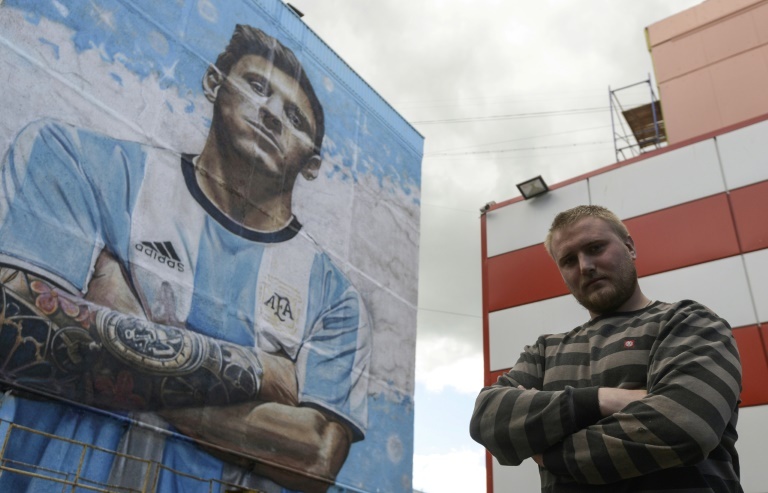 "When I was painting Messi, I was painting a legend of my time," says Sergey Erofeev, the artist responsible for the huge mural of Messi located on a wall just a short walk from Argentina's World Cup team base. "Messi is the best, he has lots of Ballons d'Or and Golden Boots," Erofeev, a well-built Russian who goes by the name "Esat786" on social media, tells AFP. Eager to show his masterpiece from all angles to curious passers-by, he explained how he won a competition to earn the honour of producing a work to commemorate the five-time world player of the year. He added, somewhat shyly, that he would like for Messi to come and see the painting at some stage during the tournament, which begins for Argentina against Iceland on June 16 in Moscow.